Châteauneuf du Pape wine tours with a native sommelier. Châteauneuf-du-Pape, one of the world’s greatest wines. Great wines are produced in the southern Rhône valley particularly in the sun-drenched Provence appelation called Châteauneuf-du-Pape. From the opinion of many wine expert, Châteauneuf-du-Pape is one of the world’s greatest wines. One of the oldest wine-growing areas in France, Châteauneuf-du-pape endured a century or more being ignored, misunderstood, under-valued. The 1980s and 1990s brought renewed interest, respect and recognition to these wonderful wines until 2007 when The famous American magazine specialized « The Wine Spectator » proclaimed that the best red wine in the world is French and it’s a Châteauneuf-du-Pape. The best grenaches of the world are on the terroirs of Châteauneuf du Pape: We do not find elsewhere the vinosity, the creamy side, the velvety that make this balance. Moreover, who knows that the village of Châteauneuf-du-Pape was the summer residence of the Popes when they left Rome to settle in provence in the 14th century? Who knows that this village was part of an independent state since 1348 and did not become French until 1791 after the French Revolution? Who knows that the man who overcame Phylloxera disease that decimated 95% of the vineyard in Europe at the end of the 19th century was a wine-grower of Châteauneuf du Pape? With a native like me, the terroir will have no more secrets for you. Enjoy my privileged relationship with the winemakers who trust me and give me the keys to their wineries so that I can open doors which are usually closed. Half Day Chateauneuf du Pape Wine Tour. Non private (from 2 to 8 person): Starting from 90€/person. This tour includes: A walk through the vineyard to discover the Terroir. I will explain the singularity of our unique Terroir, characteristics and the origin of the formation of soils, the connection between the climate, the wine growing, and the grape varieties. 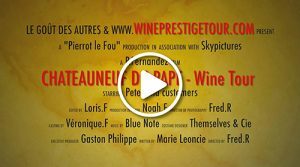 Commented wine tasting session in 2 family run wineries in Châteauneuf du Pape (detailed tour of the wineries, wine-making unit and aging cellar). Pick-up and drop-off services in Châteauneuf du Pape. Full Day Chateauneuf du Pape Wine Tour. Non private (from 2 to 8 person): starting from 140€/person. Morning: A walk through the vineyard to discover the Terroir. I will explain the singularity of our unique Terroir, characteristics and the origin of the formation of soils, the connection between the climate, the wine growing, and the grape varieties. Commented wine tasting session in 2 family run wineries in Châteauneuf du Pape (detailed tour of the wineries, wine-making unit and aging cellar). Lunch: I take care of booking your table in a « Provençal » typical restaurant (To be paid directly). Afternoon: Commented wine tasting session in 2 more family run wineries in Châteauneuf du Pape (detailed tour of the wineries, wine-making unit and aging cellar). We offer you a more intimate immersion with the privatization of the vehicle, visits and tastings. Half Day Private: starting from 155€/person. Full Day Private: starting from 260€/person. Pick-up and drop-off services from Aix en Provence, Marseille, Gordes, Saint-Remy de Provence, Uzes, Arles, Nîmes, et cetera. It is not possible to take a reservation for only 1 person. The minimum number of people possible is 2. The maximum number of people possible is 8.